CRIMINAL MISCHIEF – On August 19, 2015, Patrolman Thomas Prince was dispatched to a residence on the 900 block of Leeward Ave., for a criminal mischief report. The resident reported that damage was done to a vehicle sometime during the overnight hours. The incident is being followed up by detective Adam Greisemer. WARRANT ARREST – On August 20, 2015 at 1:45 am, Patrolman Dennis Allen stopped to speak with a subject near the municipal boat slips on Compass Avenue. It was learned that the subject, Sean Gavin, 27 from Bayville, had an outstanding warrant from Berkeley Township. The subject was turned over to Berkeley Township Police. CRIMINAL MISCHIEF – On August 22, 2015 at 12:02 am, Patrolman Chad Anthony was dispatched to a residence on the 1200 block of Spray Avenue for vandalism to a vehicle. The resident reported that they observed kids jump on a vehicle causing scratches and marks. 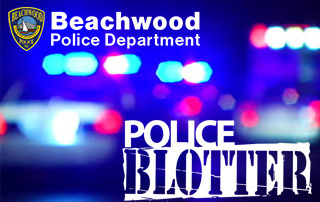 THEFT – On August 23, 2015 at 9:00 am, Patrolman Phil Schena was dispatched to a residence on the 100 block of Beachwood Boulevard for a theft report. Upon the officers arrival, the resident reported that the front tire on their mens specialized black bicycle was stolen. CRIMINAL MISCHIEF – On August 24, 2015 at 10:31 am, Patrolman Justin Apel was dispatched to the St. Paul’s Lutheran Church, 130 Cable Avenue, for a criminal mischief report. Upon the officer’s arrival, church personnel advised that a window was broken sometime between August 14 and August 24. There were no signs of any entry into the church and church personnel advised that the damage may have been caused by kids that regularly play baseball in the near by empty lot. DWI – On August 26, 2015 at 8:14pm, Patrolman Keith Meissner arrested Richard Yakovchuk, 40 from Beachwood and charged him with driving while intoxicated. The arrest was made as a result of a motor vehicle stop conducted by Patrolman Meissner in the area of Ship Avenue and Elm Street. The driver was transported to Beachwood Police Headquarters where he was processed and released. BURGLARY – On August 27, 2015 at 10:33 am, Patrolman Sean Langan was dispatched to a residence on Starboard Street for a burglary report. Upon the officer’s arrival, he was advised that the rear door to the residence was damaged and that someone had entered the home some time between August 12, 2015 and August 27, 2015. The residence was unoccupied at the time of the incident. The follow up investigation is being handled by Detective Adam Griesemer. THEFT – On August 29, 2015 at 6:27 pm, Officer Gina Bruno responded to a residence on Wave Street for a theft report. The resident reported that after posting a cell phone for sale on Facebook a individual showed up to look at the phone. After some verbal dialogue between both parties, the individual left without paying for the cell phone. Based on the officer’s investigation, the individuals have knowledge of each other and have had prior contact. TRESPASSING – On August 30, 2015 at 10:22am, Patrolman Phil Schena was dispatched to a residence on the 800 block of Forecastle Avenue for a suspicious person that entered the rear fenced in yard. A second call for a suspicious person caused Patrolman Justin Apel to respond to a residence on the 700 of Tiller Avenue. A resident on Tiller Avenue reported that a male subject was seen inside their vehicle which was parked in the driveway. Patrolman Apel was able to locate the subject and upon further investigation it was learned that the same subject was involved and identified in both incidents. The subject, Jeffrey Harrop, 18 of Beachwood, was arrested and charged with burglary and trespassing. CRIMINAL MISCHIEF – On September 01, 2015 at 6:48pm, Officer Gina Bruno was dispatched to the 900 block of Leeward Avenue for vandalism to a vehicle. Upon arrival, the resident reported that a vehicle parked in the driveway was damaged. The resident reported that they have had prior incidents involving vehicle damage and believe the occurrences are specific to them. The incident is being followed up by Detective Dan Altman.